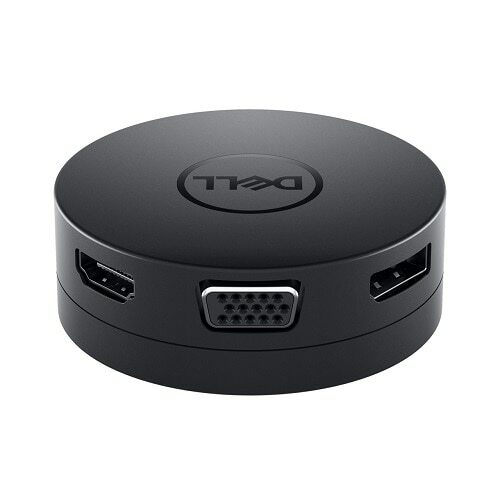 Featuring the widest variety of port options available, the Dell USB-C Mobile Adapter - DA300 offers seamless video, network, and data connectivity, in a compact design. Featuring the widest variety of port options available including HDMI, DP, VGA, Ethernet, USB-C and USB-A, the Dell USB-C Mobile Adapter - DA300 offers seamless videoi, network, and data connectivity, in a neat, compact design. Easy to use, the adapter is ready to go when you plug it in - no installation of external drivers is necessary. Pair your adapter with Dell systems to enjoy Business Class featuresi such as MAC address pass-through, PXE Boot, and Wake-On-LAN. It works with most operating systems, including Windows and MACi. 1. Only one video output is supported at a time. resolution will be 4K at 30Hz. to 10 Gbps is supported. 4. USB mice, keyboards, mice dongles, select SSDs and flash drives. remotely using the signal over your network. adapter MAC address every time your laptop is connected to the network, ensuring that your PC’s MAC address stays the same no matter which USB-C adapter you use. 6. Tested with macOS High Sierra 10.13.4 and macOS Sierra 10.12.6.